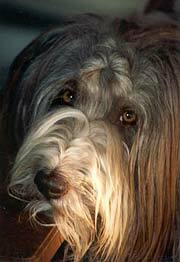 The Bearded Collie is a very old sheep herding breed originating in Scotland. Few records were kept in the early days, however, so its exact history and development is not known. The term 'collie' is generally thought to refer to sheep or denote a sheep herding dog, much like the term 'terrier' refers to the go-to-ground job those breeds were bred for, rather than indicating any genetic relationship among the various Collie breeds. Nearly dying out in the early half of the 1900s, the breed was saved from extinction and resurrected from just a handful of dogs. Beardies were officially recognized as a breed in Canada and allowed to compete in the show ring in 1970, and in the U.S. in 1977. Beardies are happy-go-lucky characters - friendly exuberant and fun loving, silly and sweet, but with the intelligence and determination of a serious working dog. They are always thinking, often trying to manipulate situations to their own benefit, and can at times be very sensitive too. Visit the Temperament page for more about Beardie personality. Beardies are a breed of moderation rather than extremes. There are no dramatic distinguishing features as you might find in other breeds such as pushed in faces, extreme height or weight, very short legs, droopy eyes, etc., which often predispose those breeds to certain health problems. Although modern grooming techniques and breeding for longer, more profuse coats have changed the look of the breed somewhat, the basis is still a medium-sized, natural, shaggy dog. Tails are never docked (this is one way to tell them apart from the tailless Old English Sheepdog, for which Beardies are often mistaken by the general public) and ears are never cropped. Viewed from the side Beardies are rectangular in shape - longer than they are tall by a 5:4 ratio. One notable distinguishing feature of a Beardie is the sweet, bright, enquiring expression - hard to describe but when one is familiar with it it's unmistakable! The coat is long and hangs down flat to the body. It takes several years to go from the short, soft, fluffy puppy coat to the typical adult coat. In between comes the adolescent 'uglies' when puppy coat is shed and the adult coat still has to grow. 'Scraggly' is probably the most descriptive term for the coat at this stage! As with any long-coated breed they require regular grooming to keep them mat-free. For more information visit the Grooming page. Colour is generally any shade of black, grey, or brown, usually with varying degrees of white markings. A Beardie can change dramatically in colour from birth to adult. Check out the Colours page for more information and photos. To learn about the Beardie in more detail, check out the links in the sidebar. We have also included general dog information such as dog-related products we recommend, and tips and advice on raising puppies gained from many years of experience and which is applicable to any breed.